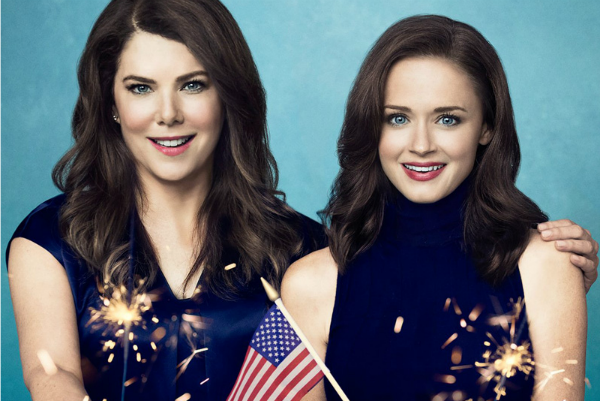 “The Gilmore Girls: A Year in the Life” – SPRING opens with an uncomfortable situation that is Emily and Lorelai’s first therapy session. The two remain silent for most of the one hour ordeal. Stars Hollow town finds itself in the spotlight when Lorelai’s Inn, “The Dragonfly” hosts a small group of B-level actors who are part of a big film shooting nearby. The fact that the town is housing B-level actors and not the A-list stars such as Matthew McConaughey, Jennifer Lawrence and Jessica Chastain who are also in the film, angers Taylor who thinks they should be patronizing Stars Hollow as well. Lorelai’s strange dreams continued. One in which was about the real famous singer Paul Anka taking place of her dog by the same name. During their second therapy session, Emily reminded Lorelai about the time she ran away from home at age 16 while pregnant with Rory and didn’t contact her and husband Richard for years after. Rachel Ray was the next chef to take-on the Dragonfly Inn’s kitchen. She advised Lorelai that maybe employee Michel doesn’t want to leave the Inn and life has a way of working itself out. Lorelai felt better then fired Rachel Ray’s pop-up in her kitchen because none of the B-actors were eating. Emily did something out of character by inviting only Luke, Lorelai’s boyfriend, to dinner at her house. After he showed-up with Lorelai anyway, Emily stole Luke away to reveals to him that he was part of one of Richard’s dying requests. 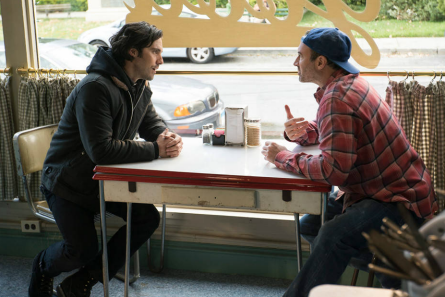 Apparently Richard’s attempt to look-out for Lorelai after his death stretched into Luke’s dinner business by leaving Luke “a sum of money” for him to use to “build an empire”. Rory revisited her old private school with her long-time frienemy Paris Gellar whom was in the first installment “Winter” running her own surrogate clinic. Unfortunate timing put Paris in plain view of her old beau Tristan flirting with a girl. Paris got enraged and revealed that she’s divorcing Doyle. Also, her kids like her nanny more than her. The Headmaster, who favors Rory, tossed her a life boat by offering her a job as a teacher there if she’d like to get her Masters degree. Rory did not accept. In Rory’s continued search for a writing job, her interview with GQ magazine editors suggested that she write a spec article for them. This would potentially employ her with the magazine. The topic, “lines”. Rory set out to discover the uneventful and non-newsworthiness community of line dwellers, or people that wait in line for stuff. One of her interviewees bragged “I was one of the first people to try a cronut and it was kind of a religious experience.” Lorelai who joined Rory in her line adventure, ended-up with the perks of this opportunity. In line is also where Lauren Graham (Lorelai Gilmore) shared screen time with her other TV daughter, actress Mae Whitman from “Parenthood” series. By the end of this episode, Rory hit a brick wall and finally caved-in and contacted Sandee Says website who’d been trying to get Rory on board with them. Rory completely blew the interview by having lack of achievements to taut about. Sandee didn’t let Rory down easy, but instead very directly. Summer fun in the sun and in front of a pool is where we pick-up with Rory and Lorelai Gilmore in the opening scene of “Summer”. 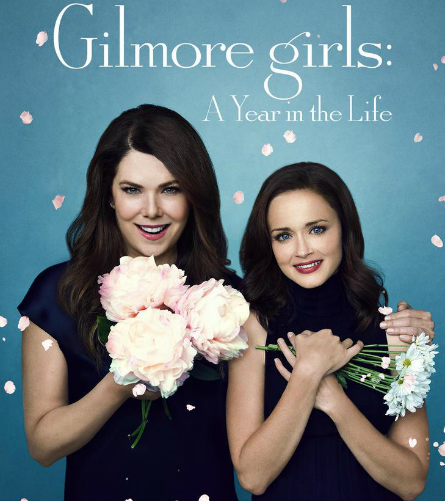 This chapter in Netflix’s “Gilmore Girls: A Year in the Life” moves Rory Gilmore into a different place in her writing career from hustling for a writing job in New York, to settling back into Stars Hollow even after persisting to locals “I’m not back!” Emily copes with the loss of Richard in a self-rediscovery phase, and Lorelai copes with the changes occurring all around her that gives her the revelation of making a bold change of her own. After insisting locals that she is indeed “not back”, Rory suddenly plants some serious roots down in Stars Hollow once she decides to take-over the Stars Hollow Gazette local newspaper after it’s previous Editor-in-Chief of 89 years steps-down and Taylor announces that it’s shutting-down. Not on Rory’s watch who seemed to be the only one that cared enough to keep it going. The operation of The Gazette provides her with an outdated DOS system and only two employees who look to be there as long as the Gazette itself. One of the smartest things Rory does in “Summer” is to finally put an end to her open relationship, which is going nowhere, with Logan. However, she’s still stringing Paul along who doesn’t realize he’s also not in a real relationship with Rory. Another ex-boyfriend of Rory’s who was bound to turn-up sooner or later, Jess (Luke’s nephew) finds Rory at her post at the Gazette office. After giving him a run-down of her life’s failures, Jess suggests that she write a biographical book about her and Lorelai. The writing for this new project seems to flow and Rory is convinced it’s her life’s calling. But, for Lorelai it’s a different story. Lorelai doesn’t support this personal passion project which puts the two in an unfamiliar place, but a dynamic very familiar between Lorelai and Emily. One of contempt. The town puts on its own theater production of “Hamilton” and this makes Lorelai question everything in her life, which brings the close of this chapter to an end with her surprising news of venturing off to experience her own version of “Wild” to discover herself. This would mean a long absence from boyfriend Luke and her family.